Save your search - find out immediately when "American Cocker Spaniel" is available at auction! American School, 19th Century Three Dogs in a Landscape. 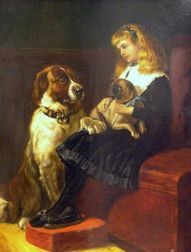 American School, 19th Century Portrait of a Girl Holding a Red Book and her King Charles Spaniel. 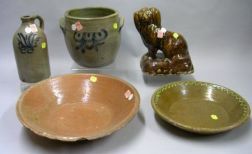 Cobalt Decorated Stoneware Jug and Handled-Crock, Two Redware Pans, and a Rockingham Glazed Spaniel Figure. 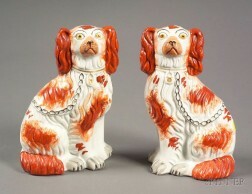 Two Rockingham-type Glazed Spaniels and a Folk Carved Mahogany Dogs Head Finial Walking Stick.